a strong presence in our local community - a community that has given so much to our club. Find out about the history of our club and the Cobra Foundation. All players are required to register with the SFL via the Sporting Pulse website. If you do not register with the SFL, you will not be allowed to play as you will not be insured. DO YOU WANT TO PLAY MINI, JUNIOR or FEMALE FOOTBALL FOR COVE IN 2019? 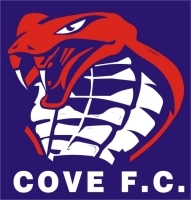 The Cove Football Club is looking for players experienced, or inexperienced, to complete existing under 13, 15 & 17.5 teams in theupcoming season. The Cove Football Club is offering the opportunity for girls to play Open Womens football in a 16 a side competition conducted on Sundays. Training occurs every Wednesday starting 21 Jan; 5.30 – 7pm. Registration / Information evening will be held in February with details to be confirmed at a later date. Training is held every Friday night and games are conducted Sunday mornings. - Under 8's (children turning 7 or 8 anytime in 2019) Training: 5.30pm - 6.30pm; game time 9am Sun. - Under 10's (children turning 9 or 10 anytime in 2019): Training: 6.00pm - 7.00pm; game time 10 am Sun. - Under 12's (children turning 11 or 12 anytime in 2019): Training: 6.30pm - 7.30pm; game time 11 am Sun. Games start end of April. If you are new to the Cove Football Club please register your interest via the 'register now' link above. Thank you to all our sponsors. Without your support we would not be the club we are today.